YouTube has changed the ranking of its search results for “abortion” after a writer at a liberal website complained that the top content list was "biased" in favor of pro-life videos. According to an article published by Slate on Dec. 21, a YouTube search of the word abortion produced numerous pro-life results. These results included videos of former abortion-provider-turned pro-life activist Antony Levatino and one by conservative commentator and editor of The Daily Wire Ben Shapiro. “When you Google ‘abortion,’ the top results are relatively staid considering the divisiveness of the topic in American life,” wrote April Glaser of Slate. “If, until recently, you did the same over on Google-owned YouTube, it felt like you were searching in a whole other universe," Glaser lamented, suggesting that facts about abortion procedures should be suppressed and hidden from the public. After Slate contacted YouTube about its search results, the popular video-sharing site responded by down ranking the pro-life videos. The Christian Post did its own YouTube search of the word abortion on Wednesday. 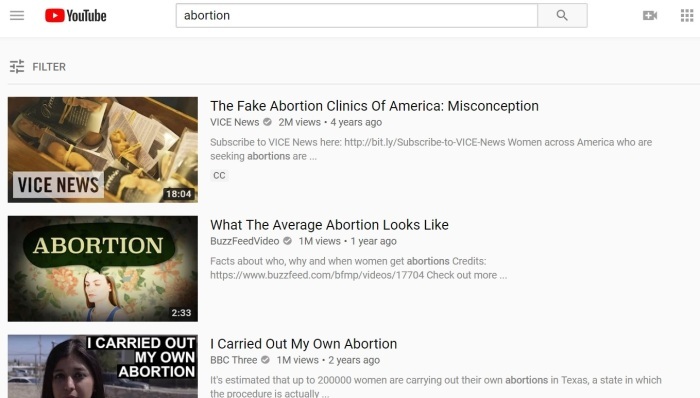 The top result was a 4-year-old video titled “The Fake Abortion Clinics of America: Misconception,” by the left-leaning pro-choice VICE News. The top 10 results from CP's search included videos that featured news stories relating to abortion, a BuzzFeedVideo providing demographic information on the average abortion recipient and abortion statistics, some of which are debated, and a 16-minute commentary on abortion laws from liberal pro-abortion comedian John Oliver. “Because they reveal the unmistakable details of what takes place in every abortion — details that Glaser rightly, albeit dismissively, describes as ‘gore’ — they’re written off as ‘dangerous misinformation,’” wrote DeSanctis in column on Saturday. In February, a pro-choice writer with Gizmodo reported that Google Maps was directing women who are seeking abortions to pro-life pregnancy centers instead of abortion clinics. "I contacted 20 people in cities and states across the U.S. to ask them to go to Google, either on desktop or on their phones, enter 'Where can I get an abortion near me?' and then click on the resulting map to see what happens in their locations," noted Robin Marty of Gizmodo earlier this year. "In all but two (Little Rock, Arkansas and Queens, New York) crisis pregnancy centers were offered up as abortion clinic options whenever that sentence was entered." Marty blamed Google Maps' "mostly unmonitored and unlimited user intervention" for the site preference for pregnancy centers over abortion clinics. "The star rating system offers another way to create a more visible CPC and a less visible abortion clinic, with abortion opponents offering two and one star reviews for local abortion providers, and writing three and four star reviews for the pregnancy care centers," added Marty.